PPG has followed its guidance on Mazda’s dazzling but more complicated Soul Red Crystal paint with two videos on another “takumi” color, Machine Gray Metallic. The films, posted in late September to the PPG Refinish YouTube page and accompanied by technical bulletins on the PPG Refinish website, explain how to handle both minor touch-ups and full-panel refinishing with the color, coded 46G. 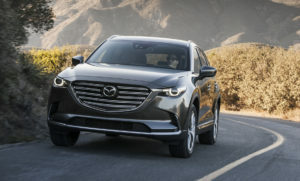 Machine Gray first appeared here in the U.S. about a year ago with the 2016 CX-9. It is available on other models too as an $300 option. The video also provides advice for gun settings, viscosity and reduction. Use a 90-degree X-pattern in both minor and full-panel refinishes, the narrator states. “It’s the proper way to align the leafing aluminum correctly,” he says in one film, referring to a metallic element in the three-layer factory paint. Both videos also warn against using a final control coat, “which would create coarseness or too much sparkle,” the narrator states in the partial-panel video. The full-panel process is similar to how one conducts minor spot work with Machine Grey, but it involves three coats instead of two, the narrator states. He advises applying two sandable clearcoat layers prior to the basecoat. “A smooth clearcoat layer for the basecoat is essential in order to achieve the proper orientation of the leafing aluminum,” the narrator states. Want to learn more about auto paint and refinishing? Hear from Z.P. Czornij of BASF during “The creation of car colors of the next 3 to 5 model years” and John Niechwiadowicz of QLC (for BASF) during “Thorough Estimate Techniques for Special Finishes.” The sessions are part of the Society of Collision Repair Specialists’ Repairer Driven Education Series Nov. 1-4 during SEMA in Las Vegas. Register here for the individual classes or the series pass package deal. Learn more from Mazda and PPG about refinishing the Soul Red Crystal (Code 46V) color, available as a $595 option, with our coverage here.